Kim Kardashian wants to present a new project “The American Next Superstar Blogger” – a reality show for bloggers. Now almost nothing is known about Kim’s idea. The star has huge experience in creating the popular shows. You already can see a poster promoting a start of casting for the reality show. 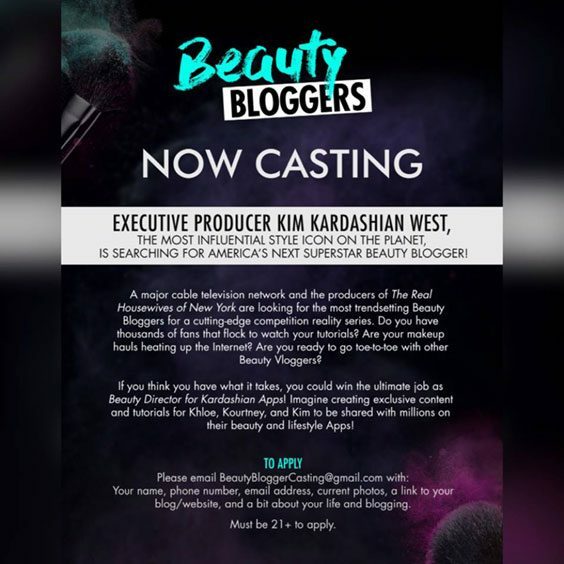 From the information on the poster you can also see that the aim of the show is searching for a beauty-blogger with great talent. It is still not reported if Kim would appear there herself and how this all would be done. We already know that the winner would be able to become the Director of applications Kardashian Apps and to continue working together with Kim, Chloe and Courtney in order to develop new products and content. Kim is known as a wife of Kanye West and by the creation of the famous show about the Kardashian family. However, the diva wants to achieve even much. Now Kim is passionate about creating unique makeup tools and clothes design and designer perfume line.